The Clay Bird is a slice-of-life movie set against the backdrop of Bangladeshi independence. As a viewer without much background in this corner of the world, I may not have been as moved as, say, Bangladeshi audiences were. Still, The Clay Bird is a good piece of armchair anthropology, if that’s your cup of tea. Looking for some point of cinematic reference, the closest I can come is Osama or Baran. It’s not surprising there are so few connections, considering that this is the first feature from the husband/wife writer/director team, and the first Bangladeshi-language film nominated for an Oscar. In case you missed them, Osama is about a girl forced to live as a boy under the Taliban in Afghanistan, and Baran is about an Afghani refugee girl in Iran passing as a boy to find work and help her family. 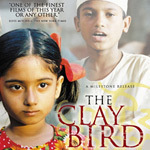 While The Clay Bird isn’t as desperate as these films (nor does it have the gender-switching story), it too tells the story of a strict Muslim upbringing from the eyes of a boy. More than a plot, The Clay Bird has characters. In the center is Anu (Nurul Islam Bablu), a boy of about ten who is sent to madrasa (Islamic religious school). Although his mother (Rokeya Prachy) is fairly progressive, his father Kazi (jayanto Chattopadhyay) is very conservative, maybe even fundamentalist. He’s disgusted by the showy, open culture of Hunduism that coexists with the Muslim in their town, and that may be spurring the people into liberalism. One such “victim” of Western thought is Milon (Soaeb Islam), brother to Kazi and uncle to Anu. The movie follows Anu to madrasa where he fits in best with the other outcasts. Rokon (Russell Farazi) has too active an imagination for Islamic school, and the other students and even the teacher single him out for humiliation. Luckily, Anu isn’t so conspicuous, even if he befriends Rokon. The most important development has little to do with the characters, although it affects them all. It is the military crackdown after Bangladesh’s first free elections were ruled invalid by Pakistan. Adding texture to the movie are singers who draw crowds of locals to their concerts. Unlike anything you’d see in America, these singers work in small groups, outdoors, with only one or two instruments and voice. Their songs tell stories of philosophy and politics (the title comes partly from one of these songs, about an earthbound clay bird who dreams of flight). Where you’d see a newscast in an American film, The Clay Bird shows a well-attended street concert. They key difference between The Clay Bird and Osama or Baran (aside from geography) is The Clay Bird’s portrayal of both a repressive Islamic culture, and a more open, freer alternative. Of these three, it is the most hopeful and optimistic, thanks to progressive characters like Anu’s mother and uncle.. This may make it more palatable to a broader audience. On the other hand, this optimism makes the film less interesting. It doesn’t have as strong a visceral impact. Where Osama is tense and frightful, The Clay Bird is merely bittersweet. In any case, it’s a sign of hope that films from Islamic nations are playing in Denver. In this post-September-Eleven era, citizens of the West need to understand the Muslim world, and films like The Clay Bird are a good step in the right direction.